Happy Monday! 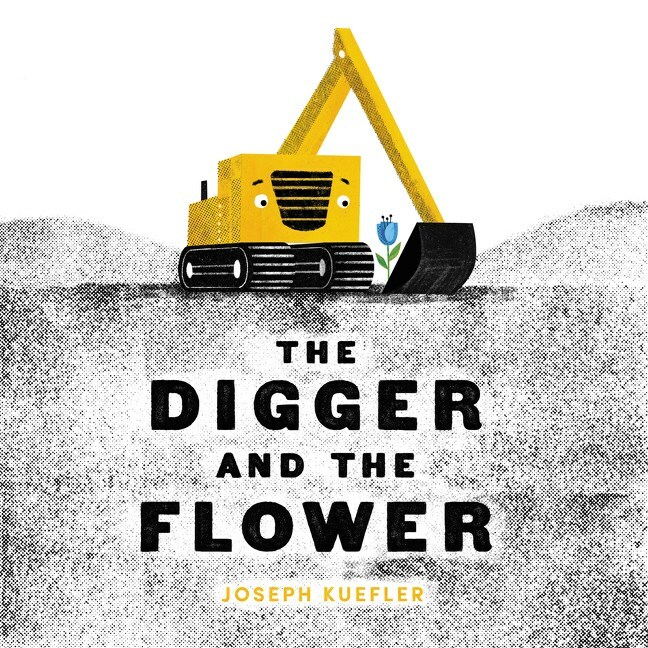 Author-illustrator Joseph Kuefler dropped by to chat with me about The Digger and the Flower, school libraries, and Lou Ferreri. I wrote the words in purple, and he wrote the words in black. Thank you, Joseph! 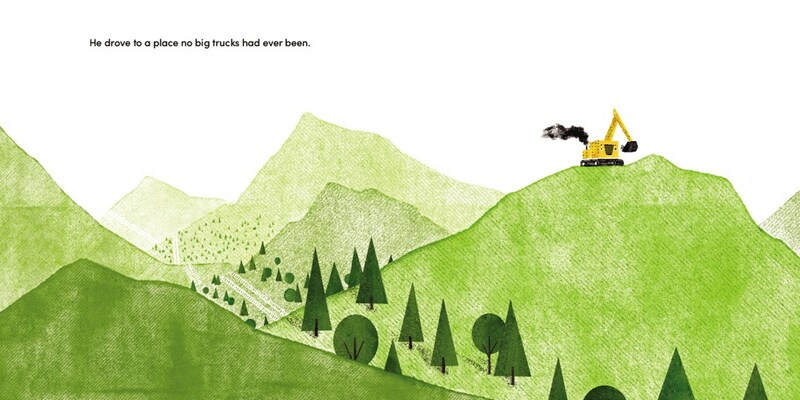 The book trailer for The Digger and the Flower reveals very little about what actually unfolds in the book. That was by design. The best movie trailers evoke the spirit of the film but keep many of its details a tightly-guarded secret. I wanted to create something similarly tight-lipped. Hopefully it piques your interest enough to head to your local bookstore or library. Digger discovers a tiny blue flower growing amid the steel and din of the city, a small piece of beauty in an otherwise drab and manufactured place. Digger is a nurturing excavator, so naturally he decides to care for the flower. As the flower grows, so too does the city. Soon, the flower’s small plot becomes valuable real estate and...well...you’ll need to read the book to find out what happens next. Digger has a very personal significance to me. When I was 19 I drove West—desperately Kerouac-ian, I know. On the second day, I found myself in Glacier National park. I’d never been to the mountains, and I was immediately and forever changed by Glacier’s grandeur and beauty. Five years later I returned to find the glaciers had nearly vanished. I saw firsthand how fragile even the most majestic and seemingly-permanent of places can be. This deterioration of our sacred spaces is happening all over the world. It breaks my heart. 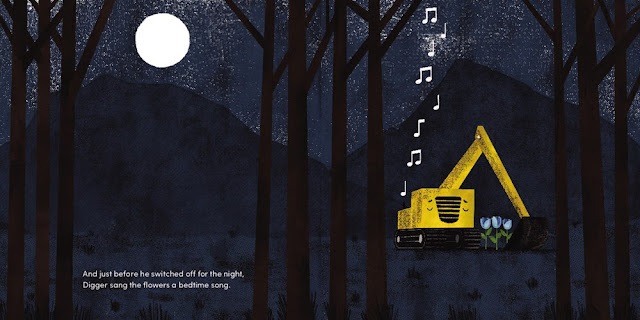 I wrote The Digger and the Flower as a sort of love letter to nature. The Digger and the Flower’s illustrations were an exercise in reduction and simplicity. I was determined to tell Digger’s story in as few moves as possible. In part because my previous books didn’t afford me that opportunity; I was eager to take on that sort of challenge as an illustrator. But also because this book ran the risk of becoming a heavy-handed and didactic lesson. Spare, objective art and text was the perfect foil for the book’s more emotional message. School libraries are the building’s beating heart. Mr. Schu, you should have asked me to whom the book is dedicated. I love dedications. They’re actually my favorite piece of a book to create. The Digger and the Flower is dedicated to three people: Elena Giovinazzo (my agent), Alessandra Balzer (my publisher) and a man named Lou Ferreri. Elena and Alessandra have been instrumental in helping me grow as an author and illustrator, and I am forever indebted to them—for the trust and faith they placed in me. Lou was my art teacher in high school. 1960s to his core, Lou was a free spirited artist who landed in my hometown after a long spell as a professional artist in grander cities. He was hellbent on teaching art the right way, which is to say, with very few rules, a whole lot of freedom and one requirement: that you mean what you make. Through him I learned to love and respect art making and myself. Two pieces hang in my work area. One is a print by Etel Adnan, a favorite artist of mine and gift from my brother. The other is a photograph of Lou Ferreri taken while I was in high school. That photo stands as a daily reminder of the gift he gave me and the creative values he espoused. I’ve never said any of this to him. I will one day. Look for The Digger and the Flower on January 23.